Speed signs in European languages. Speed signs in European languages, non-English SID signs made in batch quantities as small as one single sign assembly. Brightly illuminated led graphics in the language of your choice, quality self adhesive vinyl text to match. High quality radar detectors operating within the continental European Kph measurement system. 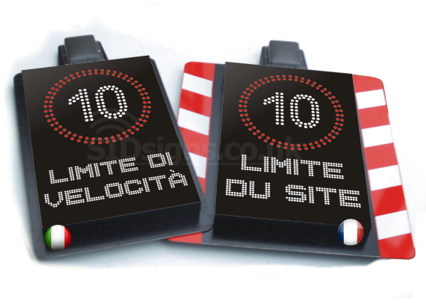 If you need a fully functional radar operated speed sign created in French, German, Spanish, Italian or any other major or minor European language there is no reason why you cannot have exactly what you need at a price which delivers exceptional value for money. Linguistic flexibility is much easier to offer when you manufacture your speed signs using a more adaptable method. Whilst other SID signs have to be built in batches we let you buy a custom made one off at a standard, run of the mill price. Whether it's a fixed message, slow down style speed sign or a dynamic, real time speed indicator style product, conversion from English to virtually any European language is a simple process which allows you to have the signs you need with the absolute minimum of fuss. Speed signs manufactured in all major European languages. No minimum orders, one off's a speciality.